Very kindly, said Bit O’ Meat took me out on quite the hot date night – dinner, and a ticket to see Deerhoof and friends at the Corner Hotel. 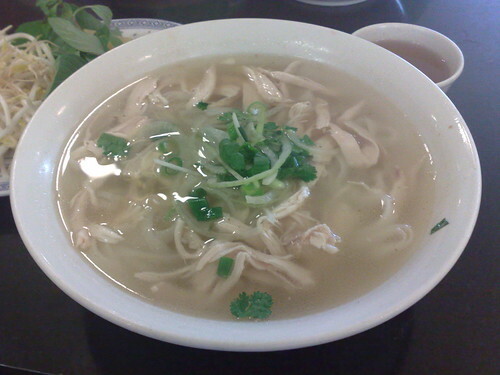 It seemed natural that pho in nearby Victoria St be sampled. All I had to do was pick a place, and Urbanspoon helped me narrow it down, as did fellow food blogger and Twitter chum @cloudcontrol, and a wonderful review by Iron Chef Shellie (essential reading for the adorable pho pronunciation aid poem! Definitely helped me). Thus, I ended up at Chu The Pho Bo Ga. I wasn’t quite game to order @cloudcontrol’s suggestion of the special beef pho, and decided on the admittedly tame shredded chicken pho, and Bit O’ Meat splashed out on the beef and chicken pho. The waiter that greeted us and took our order was very friendly by direct contrast to my previous dining experience at Ling Nam in Chinatown. We were immediately served hot tea, which I believe is complimentary. Next to where we were seated, a page from one of The Age’s 2006 weekend magazines was proudly laminated and glued to the wall. So others think the pho here ain’t too shabby, eh? Good to hear! I got right in there and heaped mung bean shoots and holy basil served on the side. So yummy. See the deliciousness that lurks beneath the soupy surface! I stole a piece of the thinly sliced beef from my dining companion. The broth on this dish was much darker. To be complete greedy guts, we decided to get an order of pork spring rolls. 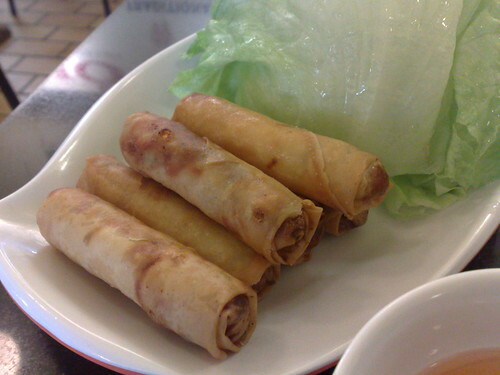 They were served with fresh lettuce leaves and dipping sauce. The companion had more than I did as the pho had filled my belly up good and proper. 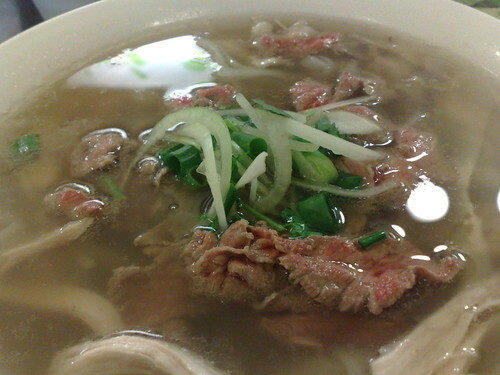 Not the flashiest restaurant, but my gosh, I’d so go back – will definitely try the special beef pho on another occasion. There was a steady stream of diners and take-away-getters, and on a Wednesday night too. Though rice noodles are less flavoursome than egg ones, I actually prefer them. My tummy does too, digestion-wise (it can be a bit…temperamental due to IBS). This humble eatery will definitely have me as a repeat customer. I think I’ll make it my pre-gig pho go-to, giggle. This entry was posted in eatie-foodies dining out and tagged Chu The Pho Bo Ga, Melbourne, noodles, pho, Richmond, takeaway, Vietnamese food on March 10, 2010 by gem.